Knowing that a dependable expert you can trust is just a phone call or a click away is the greatest service we offer our clients. We support all your computer repair and IT-related needs, even contact with outside vendors, giving business-owners a single point of contact to resolve most problems, no matter what needs attention. We are PC Based so very limited support of Macs. We offer computer and networking services to residential and business customers. Service includes help with setup, troubleshooting, maintenance, training, computer repair, and general help across a wide variety of systems. Repair services can be performed onsite, in home or at your business location. True technology enthusiasts,our technicians are industry experts and take great pride in their work. Thinking about a NEW machine? Have a question? Give us a call or email us today. It’s that easy. We service all brands of PC Desktop and Laptop computers and tablets. We also setup cell phones to work with email. 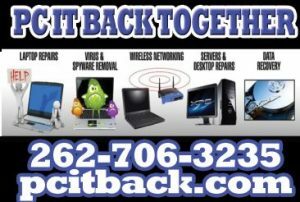 We do not fix internal broken Laptops, tablets, or phones and only limited MAC computer repair. Great Service! Great Rates! Remain Sane… We Fix the Pain!